Southeast Asian countries are struggling to curb food prices as energy costs climb. Many governments have banned rice exports to safeguard supplies, but economists say restrictions only drive world prices higher. 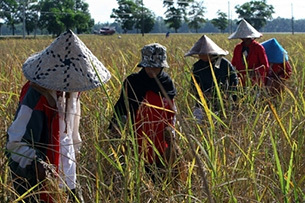 The rice fields that blanketed this remote mountain village for generations are gone. In their place rise neat rows of young rubber trees _ their sap destined for China. As Beijing scrambles to feed its galloping economy, it has already scoured the world for mining and logging concessions. Now it is turning to crops to feed its people and industries. Chinese enterprises are snapping up vast tracts of land abroad and forging contract farming deals. This quest raises both hope and criticism. Laos’ communist regime touts rubber as a miracle crop that will help lift the country from the ranks of the world’s poorest nations. China is expected to consume a third of the world’s rubber by 2020, become its largest car market and put 200 million vehicles on the road. From Southeast Asia to Africa, the Chinese are farming oil palm, eucalyptus, teak, corn, cassava, sugar cane, rubber and other crops. As in Laos, the industrial-size farms are variously viewed as an ecological nightmare or a big step toward slashing poverty. In Congo, a Chinese telecommunications giant, ZTE International, has bought more than 7 million acres of forest to plant oil palms. In Zimbabwe, state-owned China International Water and Electric Corp. reportedly received rights from the government to farm 250,000 acres of corn in the south. Indonesia is moving to develop biofuel plantations with The China National Overseas Oil Corporation – London-based Environmental Investigation Agency, an advocacy group, believes other deals are in the works, often through proxy companies because of long-running anti-Chinese sentiment in the country. The group says the project would destroy natural forest. In Myanmar, rubber concessions – Refugees fleeing Myanmar’s military regime say troops are forcibly evicting farmers to make way for rubber plantations, including some run by Chinese enterprises. A Chinese-Cambodian joint venture – converted land of the Phong tribal people into a tree plantation 20 times larger than allowed by law in Cambodia, according to the environmental group Global Witness. The group says the concession in Mondulkiri province encroached on grazing grounds, destroyed sacred sites and used toxic herbicides. “The Chinese companies do everything in their power to take advantage but they are also taken advantage of. The system is corrupt and there are loopholes and sometimes it works in their favor and sometimes against them,” says Weiyi Shi, an American economist who recently completed a study on the rubber industry. When the China-Lao Ruifeng Rubber Company moved in, the frontier village of Changee lost most of its rice fields and grazing land and its burial grounds were desecrated. The pleas of villagers got no result and some protesters were reportedly held at gunpoint, with the Chinese using coercion through local authorities. The First World world is just about to pay serious attention to the conditions spreading throughout the Third World. These headlines do not attract those disconnected from the realities of the world. America is cushioned from the bleak conditions overseas by media focus on trivia and manufactured headlines. Television news must provide “eye candy” to improve its ratings. Ratings bring advertisement. Advertisement brings profit. This is American media. Cable, Satellite and Blogs bring the up close realities of world conditions. Environmental, socio-economic and now spreading hunger are explained in detail by documentaries and investigative reporting. Agencies and Organizations tasked with addressing the needs of the casualties are seldom afforded the marketing luxury of celebrities. A telling symptom of mental health is how the masses have chosen such trivial celebrities as Paris Hilton, Anna Nicole and other sexual icons. Obsession with non-issues hampers real personal decisions. There are some very tough choices facing everyone on this planet. Those choices will be made by those few really paying attention. First World masses will remain distracted until the creeping crisis actually touches their personal lives. Then the natural reaction will be anger, reality is a rude intrusion for the distracted. China is very aware of the spreading crisis and is positioning itself for survival at the expense of those unfortunates who scrape their living from their land. We can criticize, we can complain and protest their devious methods. But, in reality, we are watching where we will be going as soon as the First World starts experiencing the symptoms. Without the participation of the masses, the decisions of our leaders will go unnoticed. Leaders will not be held to a moral standard. The “us or them” mentality will be the likely result. Religions so focused on their own cultural trivia will justify more brutal behavior from congregations. Religion has lost its ability to guide individuals, its all about political manipulation now. Enter the new American President. We do not want a President distracted with trivia and Congressional infighting. We need a President that can bring both sides to the middle so REAL issues can be addressed. We need to address realities. Focus on profit is too shallow right now … instant monetary gratification must be replaced with long term gratification. Where will be the profit is humanity does not survive?